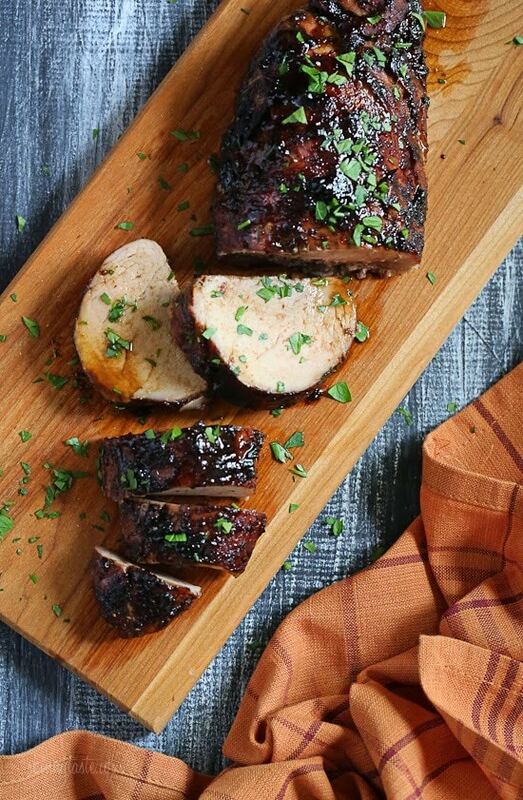 This is a great, quick and easy pork tenderloin recipe topped with a sweet & tangy glaze. It’s super simple to make with just a few ingredients which is perfect for weeknight cooking. 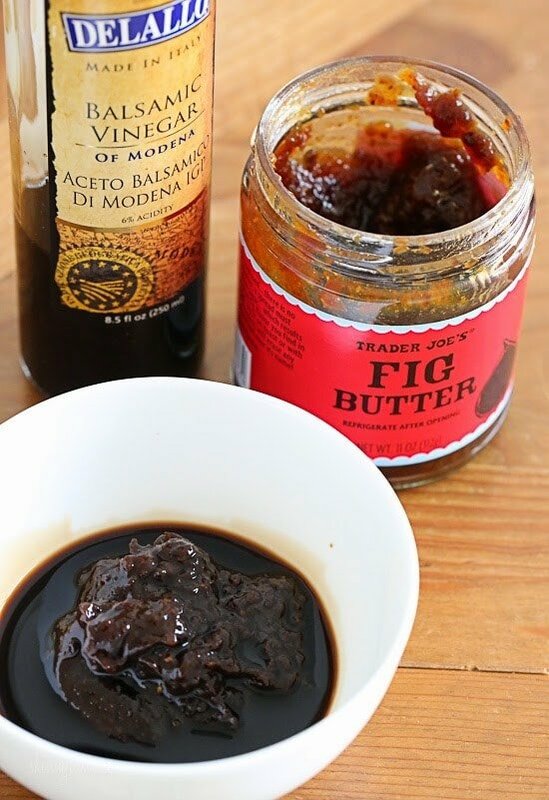 I’m pretty obsessed with Trader Joe’s Fig Butter and combined it with some balsamic vinegar to create this glaze. Then I roasted it in the oven for about 25 minutes and served it with these awesome brussels sprouts. If you can’t find fig butter, any fruit butter such as apple butter would work great. Preheat the oven to 375°F. Season the pork with salt and garlic powder and place on a baking pan. Combine the vinegar and fig butter and generously brush it all over the pork. Roast until the center of the pork reaches 145°F with a meat thermometer, about 25 to 30 minutes depending on the size of your pork and your oven. Let it rest for 10 to 15 minutes before slicing into 8 pieces. Top with parsley if desired. Season the pork with salt and garlic powder and place on a baking pan. Combine the vinegar and fig butter and generously brush it all over the pork. Roast until the center of the pork reaches 145°F with a meat thermometer, about 25 to 30 minutes depending on the size of your pork and your oven. Let it rest for 10 to 15 minutes before slicing into 8 pieces. This dish is pork dish is absolutely amazing! It’s such a favorite that we make it almost weekly meal for our family. I have shared this recipe with several friends who rave about it. I made this today and it was so delicious. It didn’t take a long time to prepare either. The flavors were out of this world. I served it with brown rice and broccoli. This is a 10 star recipe for how quick you can put it together and how fast it cooks. Such little effort for something so good. I had fig jam St. Dalfour and used Vincotto fig balsamic vinegar –I had a Penzey spice called Tzar Dust that I had been wanting to try and the description said great with pork and it was. Had similar ingredients in it as called for salt pepper garlic plus a few more. My husband couldn’t stop eating it. Is there any kind of meat substitute that would work for this recipe? Could this be made with a different protein? I don’t eat pork but love the sauce idea! Could the fig butter be replaced with apple butter? Finally made this tonight and it was as good as I thought it would be. I used Fig Balsamic Vinegar and TJ’s Mango Butter because that was what I had. My husband was very happy to learn that I had made enough for leftovers! Easy and delicious. Thank you Gina. My son & I LOVE this recipe! Bertolli makes a basalmic glaze & I used that instead of just the vinegar this time…it was great. Thanks for such an easy & tasty weeknight meal! 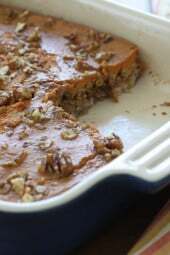 I just made this recipe using apple butter instead of fig butter. The pork was moist and tender. Will make again! Anyone grill the pork using this recipe? Thanks. Anyone try grilling this recipe? Making this for the 3rd time in a month! So good and simple! I made this last night and it was a hit! 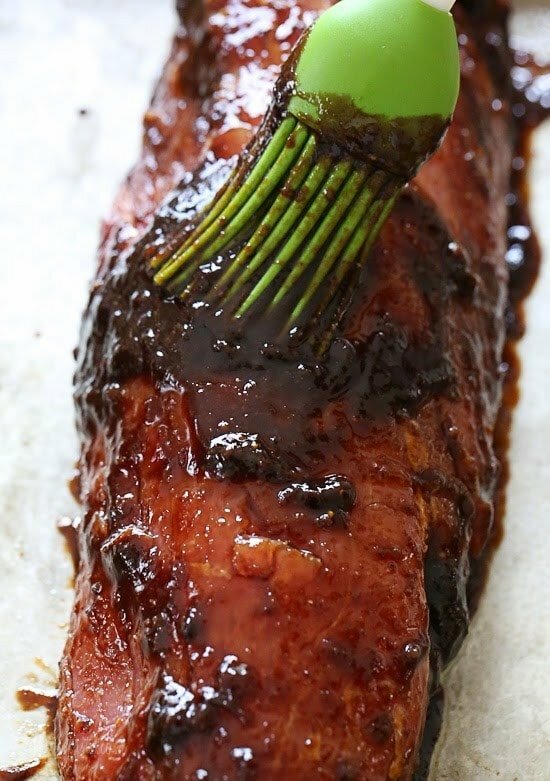 It was flavorful, easy to make and so juicy and tender. Now that I have this jar of fig butter, I would love to see other recipes using it. Thank you, Gina! Looks great! For the roasting, can you use a baking sheet or does it need to be a roasting pan and rack?? Thanks! I just made this tonight! What a hit! Great flavor and kept the pork nice and tender, not dried out. I did what was mentioned in another comment and carmelized some onions by cooking them a bit before and use some of the fig/balsamic sauce to cook with them as well, great addition to the pork! Thank you Gina! Can this be done in the crockpot? I have a 3 1/2 lb. pork loin — if it can be done in the crockpot, how long should it cook? I want to make this for a family get together next Sunday, any feedback would be appreciated. Thank you. Would you make rhis for Christmas Day dinner? Can’t figure out what to make that’s easy but fancy looking and still giving me time to enjoy the day. Sure, this one is really easy too! Very good. I used a fig jam as we do not have a Trader Joe’s close to home. I’m thinking that this would be a great baste for a roast chicken. I made this last night with TJ’s Pumpkin Butter; amazing!! But, it did take much longer to cook as it was a large pork loin. Can this recipe be used by glazing pork chops instead? And just adjusting the cook time in the oven? I only have loin chops. Any suggestions? I think I will marinate them the morning of. I was just a sprouts and I found a fig balsamic butter! Can't wait to try this now. Sounds great! Pork tenderloin is such a delicacy. It is often on sale at my area stores and I can get one as low as $4.00. I would probably leave off or cut the amount of garlic, but would probably be good either way. I used pork belly instead of pork tenderloin. I also marinated the pork belly overnight with the following ingredients: garlic, pineapple juice, coarse sea salt, muscavado sugar, pepper and cinnamon stick. I also boil the pork with the marinade for 1 hour and let it rest for 20 minutes prior to roasting the pork belly with the balsamic fig. I also heated the balsamic fig prior to basting the pork belly. The result was amazing!!! @ Lissa….I was imagining the same thing! I think this would only "oomph" the delish factor. Marinating this in advance would be the best idea ever. I made this last night and French hubby was happily stunned that such flavor complexity was achieved with so few ingredients. This is a fast, simple…yet impressive recipe that truly delivers. New-found staple recipe for an elegant-without-the-sweat type dinner. I added a bit of porto and about two tablespoons of "Nectar aux figues" (a balsamic/fig vinegar reduction) and used confiture de figue/ French fig jam instead of the Trader Joe's variety one can find in the States…because the French love their sauces!…To get the crisp look…I agree to up the temp just a bit…using the quantity of balsamic/jam mixture Gina suggests…THEN..once pulled from the oven…remove tenderloins to repose a few minutes…while simultaneously deglazing the roasting pan with a bit of porto and adding the remainder of the balsamic/fig jam concoction for more sauce if desired. Thank you Gina for this magnificent offering. Used this glaze with a pork loin instead of a pork tenderloin (obviously adjusted the cooking time and oven temp for the larger piece of meat; I used 1 hr at 400F for my ~2lb loin) and it turned out really well. Super duper moist, and a really great flavor to go with the pork. My sister did it using apple butter instead of fig butter a few weeks ago, and that also turned out really well. Finally made this with a pork tenderloin instead of pork loin as previously noted. Both are delicious, but the difference comes in the texture. The tenderloin practically melts in your mouth. I slice mine super thin to fool my brain into thinking it's getting a larger portion. yummy, this recipe has a permanent place in my go to meals. Could this be done in a crock pot? And if so, how long? Also, unbeknownst to me the son of one of guest is a professional chef at a great restaurant in Oxford, MS, and he was so impressed! So if you need a star of your party that us easy, fast and perfect – this is a top contender. Fabulous! My only deviation was I used pork loin sliced in half lengthwise as it was on sale at half the cost as tenderloins. Got RAVING reviews at my open house last night. And this is so easy & fast to make; we were in the 2 hour count down to the party, the hubs said not to worry with it, but I made it any way. Was prepped & in the oven within minutes & roasted merrily on its own. Does anyone have any suggestions as to a good sauce to pair with this? I make an onion jam. Sauté a large chopped onion for 45 minutes on low. Add a tablespoon balsamic vinegar and a tablespoon (or more) of fig jam. Sauté for about 15 more minutes. I love using Dalmatia Fig Jam. It has the best flavor! This onion jam is so good you will want a dollop on each bite of pork! Enjoy 🙂 I'm making this again tonight! Made this for dinner tonight, and it was absolutely wonderful. I don't know if TH's carries fig butter all year long, but I hope they do (we have to drive a minimum of 300 miles to get to a TJ's). I'll stock up next time I'm in the neighborhood. I served this with roasted sweet potatoes with feta cheese, and a tossed salad. Great dinner. Looks so good! Definitely adding this to the menu. Yep!! Fig butter on pizza is so good. I do it with fig butter, caramelized onions and goat cheese. You can even throw on some arugula if you have it. 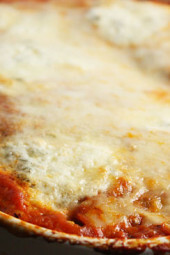 I just tried this pizza idea today, and we really enjoyed it. I think next time I'd use turkey kielbasa (I used mild Italian chicken sausage, which tasted flat to me). 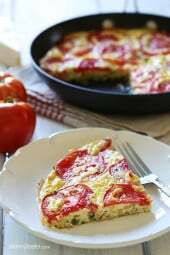 I will probably also add a sprinkle of feta cheese on the top – salty to compliment the sweet. Thanks for sharing this great idea! I made this recipe last night and it was appreciated by all. I didn't have fig butter, so substituted Maple Pumpkin butter. I also made the sauteed brussel sprouts, and the pears with honey and walnuts for dessert. From another website I made butternut squash soup and roast potatoes. Thanks for the delicious food ideas! I tried this the other night and it tasted great but did not get that crispy look on the top. Most of the figgy/vinegar melted off and was on the bottom. I used Fig Preserves… Any way to get that crispy look on top? Your problem is that you used fig preserves and not butter. Preserves has much more sugar, and it seems like it melted instead of caramelized. I got a crust using preserves. For me to get a nice crust on meat I have to build it in layers. Meaning I dab a nice coat of sauce every ten minutes or so and finish the last layer under the broiler to carmelize. If I don’t have time to baste, I dab half the sauce for most of the baking and save the last half for the finish under the broiler. It’s all about the broil ???? I'm not sure your calorie count is correct. I plugged this recipe into myfitnesspal.com that now has a recipe importer/calculator and it comes out to be 312 per serving. A 20 oz pork tenderloin has 1144 calories. Maybe this should be six servings instead of 4. That comes out as 208 calories per serving which is closer to the 198 you have noted. The pork tenderloin I bought is 120 calories per 4oz. raw. That's 600 calories for a 20 oz tenderloin. You may have been looking at a cooked tenderloin entry. Would this work in the crock pot? I made this for dinner tonight and it came out great. I didn't use the exact Trader Joes product but found something similar and I was very pleased with the result. Super easy and I loved how there were not too many ingredients , will be adding this to the rotation ! I might have to make this for my Christmas dinner. I made this last night and it was delicious! I substituted TJ's pumpkin butter for the fig butter because I had it on hand, and even my husband was raving (who just does not understand the use of sweet ingredients in savory dishes). Also, so simple for a weeknight meal! Wast this good with the pumpkin butter? What did it taste like? What a fabulous and easy weeknight meal! @ Anonymous…In Europe ..you can substitute "confit de figues"..(Fig Chutney) type jarred condiments…It is virtually the same product! Hope this helps! Thankyou, I will take a look when I go to my local Tesco this evening. I cant get fig butter here in the UK, any other suggestions? So I was in Trader Joe's last week and noticed the fig butter which I hadn't noticed before (TJ's just recently opened near me….YAY!!). I bought a jar because I was intrigued and it's been sitting in my pantry. I had no idea what I was going to do with it but now I know. Talk about perfect timing…..thank you!! I just had this and can vouch…. It was juicy and so flavorful. Very simple yet satisfying. So easy to make, too. This looks like such a simple and delicious dinner! I'll have to pick up some fig butter next time I'm at TJs. Would regular figs work? I was given a basket full of fresh figs by my sweet landlord today and am looking for some recipes to use them up. Thanks! would fig jam work? looks awesome! Yes! TJ's Fig Butter has no butter in it at all.. it's just a fig jam and the ingredients are figs, water, sugar, lemon juice, pectin…. the same ingredients in my fig jam at home! It might be a little sweet. Fruit butter by definition must have more fruit than sugar. Jam is the other way around – more sugar than fruit. Personally I'd be a little wary…that's a LOT of sugar. Could this glaze be ok if we use it in the slow cooker, similar to your Balsamic Pork recipe? I make a Balsamic and Brown Sugar pork tenderloin dish that could work with this. You season with S&P, add a half cup of water and cook on low for 6-8 hours. Then you brush on the glaze and broil for a few minutes until bubbly and caramelized. Seems like this might work for fig jam or fig butter. Looks absolutely delicious – the combination of fig and balsamic sounds amazing! TJ's Fig Butter? Genius! I have to get some! 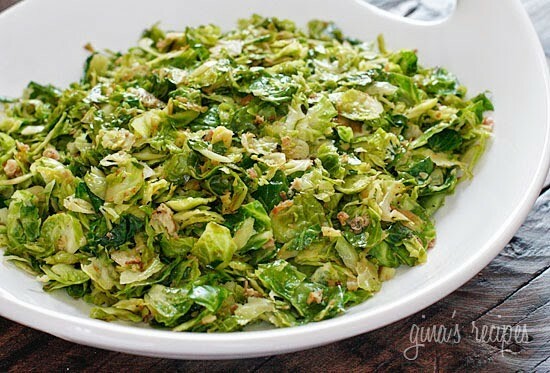 I can't wait to try this with your pancetta brussel sprouts ��. Could you use fig jam instead of fig butter? That’s what I’m going to sub out when I cook this tonight. I have a citrus fig jam that should be equally delicious as fig butter. I made the Brie and fig jam at Christmas for a party. When it ran out several people asked m3 to make more. Thank goodness I had bought 2 Brie. Enjoy it! Oh I warmed the Brie and just put the jam in a small dish next to it.